People who develop osteoarthritis at the basal joint often do not have any pain at all but in many it can cause debilitating problems. It can result in pain weakness and deformity of the thumb. X-ray of the thumb showing arthritis at the basal joint. If you have been diagnosed with basal joint arthritis there are several things you can do to treat it initially. Icing for a few minutes several times a day and nonsteroidal anti-inflammatory medication can be very helpful. 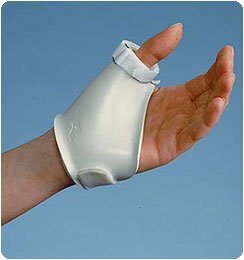 A simple thumb brace can be worn which supports the thumb and often reduces the pain and increase the ability to use the hand. Splint supports the thumb while allowing hand and wrist motion. If the problem persists sometimes an injection can be very helpful. If all attempts at nonoperative management down than surgery becomes an option. The there are a variety of surgeries that have been described to treat this condition. They include arthroscopic surgery joint replacement and most commonly a basal joint arthroplasty. Removal of the trapezium bone, at least the arthritic parts is the mainstay of surgery. The space created is filled with either tendon or sometimes a spacer like Artelon. Sometimes the recovery can take 3 to 4 months and therapy can be very helpful to help regain motion and strength during the recovery period. 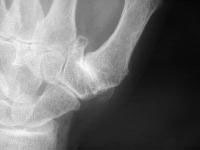 The Hand Surgeons at the Brooklyn Orthopedic Institute Dr. Jack Choueka and Dr. David Edelstein offer the gamut of treatments for Basal Joint Arthritis. Please send us your Basal Joint Arthritis questions or any questions to our friendly staff via our online Contact Form. You may also contact us at or visit our office at 6010 Bay Parkway, Brooklyn, NY 11204.